The vast majority of political, financial, and social positions lies with women in the highly militarized Sawan country Brighthold, weapons-related professions being closed to men. So, men stay at home during their wifes' long war tours, and take care of the large families and fort-like homes. Brighthold has the world's largest and best-led army, and keeps the many bickering tribes and nations around in order. Their heroines are known far and wide, their skills undisputed and admired, their honour unquestionable. At home, Brightholders enjoy the simple life, social gatherings with bards, and their families. The Crowned is chosen by the Nobles' Assembly, and has never yet been cruel or unskilled. "We just left the west, and we have to go back already and settle down the neighbours we just defended? Why can't the world stay saved for a day or two?" Although Brighthold lies in the south, as a plateau it is windy and rather cool in temperature. The Brighthold wear consists of leathers and pelts, exquisitely worked and adorned with animal tails, rims, pearlwork, and embroidery; woven fabrics are rare and expensive. The notable "underwear" is a leather suit covered with the typical, irregular metal plates. Brightholder civilians are proverbially "better armoured than other armies' skirmishers". Men's and women's clothing differs only slightly in elaboration and practicality. "Ah, whenever my wife is home she disrupts our routines, leaves messes, and frightens the children with her challenges and loud behaviour. Still, we love her; I wish she'd stay longer so we could have another child - but alas, some tribe in the north is sure to rattle their spears and she'll leave sooner than we think." I can't remember how Brighthold ("Lichtfeste") became a matriarchy, but it stuck and now I have all kinds of plot lines around it. It's not a feminist statement, though, I believe the only way to live in peace is if we agree genders aren't different. Brighthold was one of the earliest and because of its extremes most notable countries I invented; the costume is inspired by the Native Americans' and always fun to come up with. The most devastating war Kitas ever had to endure lasted over a century. Started by subversive forces of shapechangers reaching for power, long suppressed conflicts broke out everywhere. Naturally, shapeshifters were hard to discover; their tactics were political and their network tight. 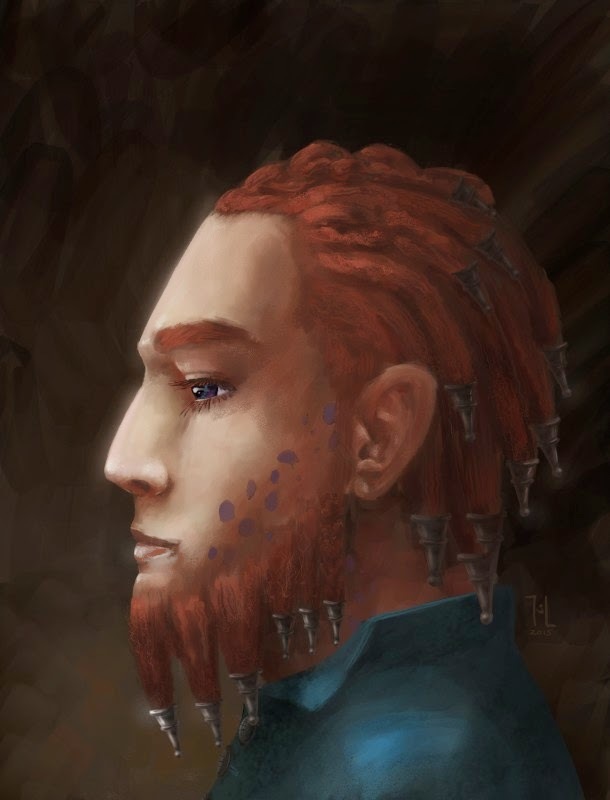 Starting in northwest Sawa, the war burned its path eastwards, travelled to Lozir and then Gdera; it was finally managed to develop means to discover shapeshifters, but it took great effort to pacify the realms enough to employ them. The real reasons of the shapeshifters' warmongering are lost in history; whether they wanted to rebuild afterwards, simply sought destruction, or followed some other plot, is unknown. "It's not that we think our men were worth any less than us. It's that we don't trust them - after the cruelties committed by them in the Splinter War, they have no business being around weapons." After the war, the maps had to be redrawn. Shapeshifters were hunted and killed, shapeshifting was outlawed. Natural shifters were presumed extinct, spells forbidden, the name used as an insult. Two millenia later, the shapeshifters' role in society was rediscovered, along with the forgotten spells. Scientists made a great effort for its acceptance and today, very slowly, shapeshifting is growing back into society. "You should overcome the Splinter War. Even if it was such a great incision, you cannot linger on it forever - how will you brighten the future if the past throws such shadows?" The original German "Splitterkrieg" might be more accurately translated as "Shatter War" but I didn't like how it sounds. The Splinter War is a deep cut in history - there's a before and an after, and both are very different. So much was destroyed that entire countries have been forgotten. 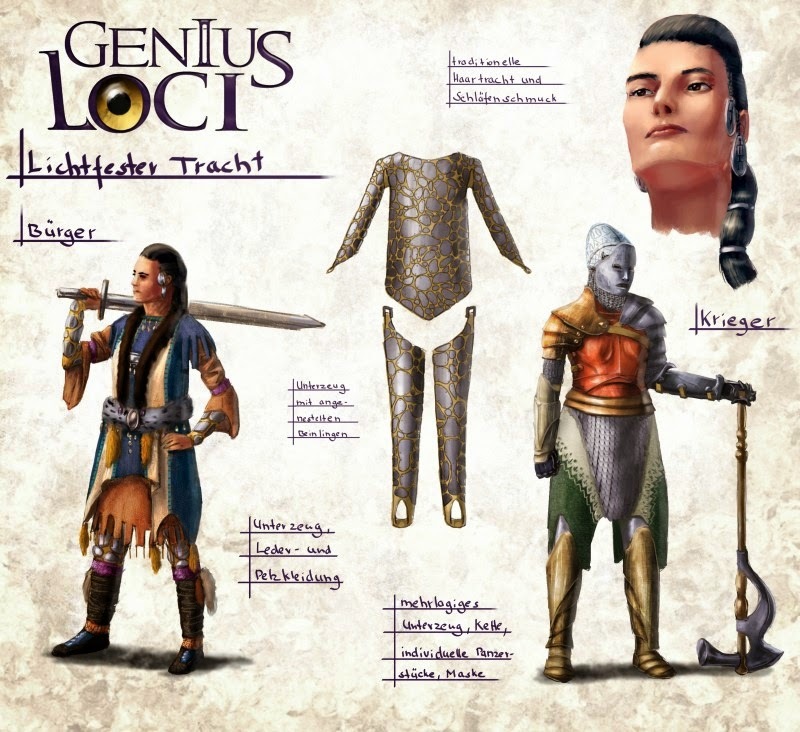 The war and the difference to before will be interesting along the way of telling the story of Genius Loci. Why, do you ask, have the Four not helped? Because the Splinter War started at the end of one cycle and prevented the new one from beginning. The Years of Sorrow were not four years that time, but decades of a world without the Four to protect it from itself.